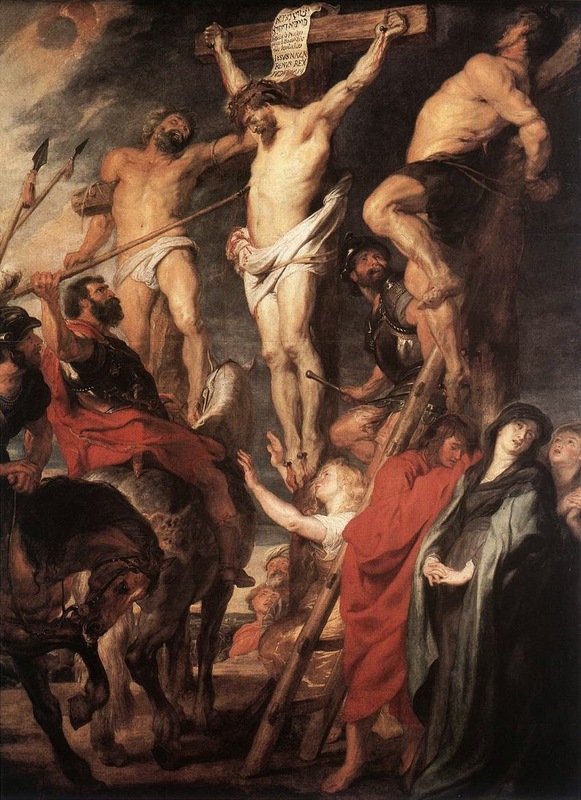 The 17th century artist Peter Paul Rubens captures, as well as I've ever scene, the chaotic scene surrounding Jesus' crucifixion. If you reflect on Luke's Passion narrative and gaze upon the the painting, Jesus' interaction with the thieves is especially poignant. Now one of the criminals hanging there reviled Jesus, saying, "Are you not the Messiah? Save yourself and us." The other, however, rebuking him, said in reply, "Have you no fear of God, for you are subject to the same condemnation? And indeed, we have been condemned justly, for the sentence we received corresponds to our crimes, but this man has done nothing criminal. Then he said, "Jesus, remember me when you come into your kingdom." Jesus replied to him, "Amen, I say to you, today you will be with me in Paradise." Karl Rahner, meditating on Jesus' Passion, prays, "You are now in the agony of death, Your heart is filled to the brim with anguish, and yet You still have a place in that heart for the sufferings of another." Even as death closes in, as the ravages of human sin threaten to steal his last breath, Jesus' mercy and charity are not extinguished. How easy and often, when we suffer, for us to turn inward and set up barriers to the world. How remarkable, then, are Jesus' actions who is so unlike us: as his head begins to sink beneath the chaotic waters of death, he continues to offer the lifeline of hope to those justly convicted. We should be scandalized by the audacity of this thief: he has squandered his life, he has made his choices, and now on the cross he is paying his due to society. In our understanding of justice, we'd say, "He's getting his due," or stated otherwise, "He's made his bed, so let him sleep in it." Moments before his death, an punishment meted out by his society for crimes he has committed, the thief risks the most audacious of prayers: he turns to the one dying next to him and asks nothing more than to be remembered. His impossible request is met by an even more impossible response: I will not only remember you in paradise, but I will bring you home with me. Catholics believe that, through the words of consecration, ordinary bread and wine become the Body and Blood of Christ. Some of my friends struggle with this belief. Yet is this not itself a Eucharistic scene, as a condemned criminal offers the substance of his life - his ignominious past, a history of failing - to Jesus and has it transformed into glory. The thief asks for the impossible and is granted nothing less than Paradise in return. For myself, I seldom have the strength or courage to pray like the criminal. I pray in a calculative manner, I pray for things that are likely to come to pass, things I can imagine as fitting into my (admittedly narrow) view of the world. How much then I have to learn from the thief dangling at Jesus' side: powerless to bring about any change other than to turn my heart to the One who saves and ask the impossible. I can pray only that my life, like the bread and wine offered at the Mass, be an unsuitable and unworthy offering...and that Christ's words of mercy will carry my life, as the bread and wine are transformed, into the life of the Kingdom. I also want to pray like the criminal.